Get professional experience editing, writing, and designing for magazine, print, and online projects. Other opportunities include planning events, marketing, public relations, social media, and web development projects. The WLT Book Club is open to all students, faculty, and staff at OU. Members receive a free copy of each book the club reads and meetings are held once a month in Monnet Hall with a free lunch and discussion. The Student Advisory Board is a student-led organization at OU that advises the WLT staff about improving the magazine, brainstorming ideas for events and promotions, and raising WLT’s visibility on campus. World Literature Today has been in publication for over 90 years. Founded at the University of Oklahoma as Books Abroad in 1927, the magazine is now published four times a year and has readers and subscribers all over the world. 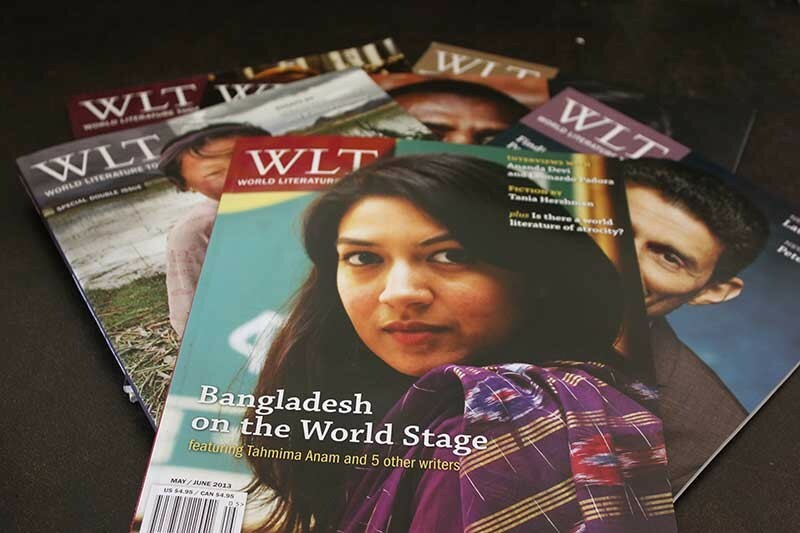 Check out the current issue of WLT at www.worldliteraturetoday.org. World Literature Today is a thriving hub of student opportunities at OU. Get involved with the magazine by applying for an internship, joining the Student Advisory Board, taking one of our courses, or attending the Neustadt or Puterbaugh Lit Festivals that we host right here on the OU campus.